During the 2018-2019 season, the J.F. Kennedy Wrestling team got off to an unprecidented start. The wrestling season began with 28 wrestlers (boys) and 4 wrestlers (girls) on the team but by early 2019 had dropped to only 5 boys and 1 girl. Brian Ewing returned to the fold as head coach and guided the small team of grapplers through their paces. In this short time they worked together, competed and won several individual matches. Coach Ewing says individual goals for all wrestlers include making it to the NorCal Divisional Tournament and ultimately the California State Tournament. Jordan and Carlos, at 113lbs and 220lbs, respectively, each earned victories at league championship tournament at Laguna Creek on Feb. 2. 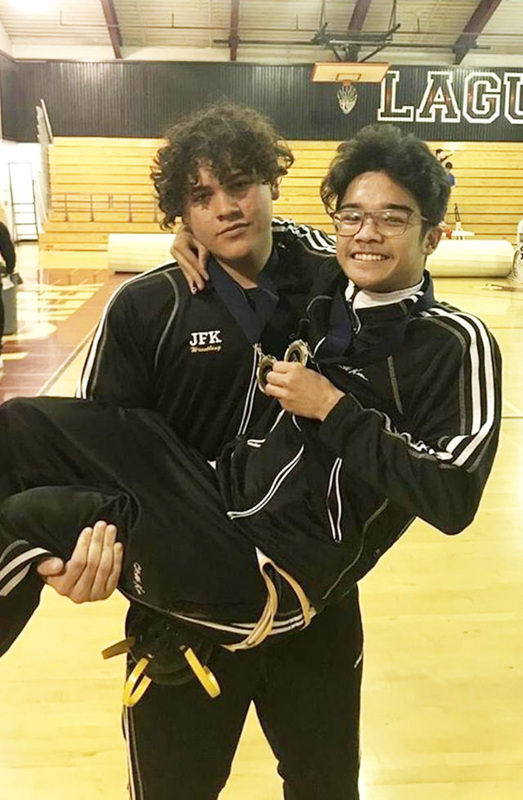 Kennedy wrestling champs Carlos Garcia and Jordan Noble pose after winning individual matches at the league tournament at Laguna Creek on Feb. 2 Photo courtesy Jordan Noble.